Have you thought about what your love language is? The idea that we all give and receive love differently through 5 love languages was introduced by Gary Chapman. Though “love languages” have entered our everyday lexicon often enough that I honestly have no idea who this dude is. The way I show love to others is through acts of service. Doing things. Primarily, cooking for others. Maybe this is one reason I like to share recipes and encourage people to make their own food. I think there’s something special about making food for other people rather than just buying them dinner. When a dish comes together out of basic ingredients that your friends or family enjoy – it’s the best feeling. So let’s all agree to cook for each other more. Or, find those friends that love to cook and show your love for them through your own language. 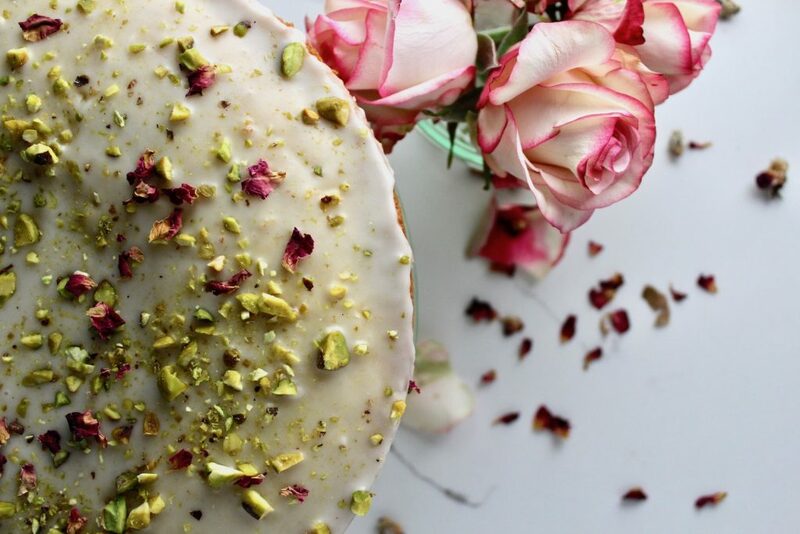 Today we’re making Persian Love Cake. Do you like how I themed that? 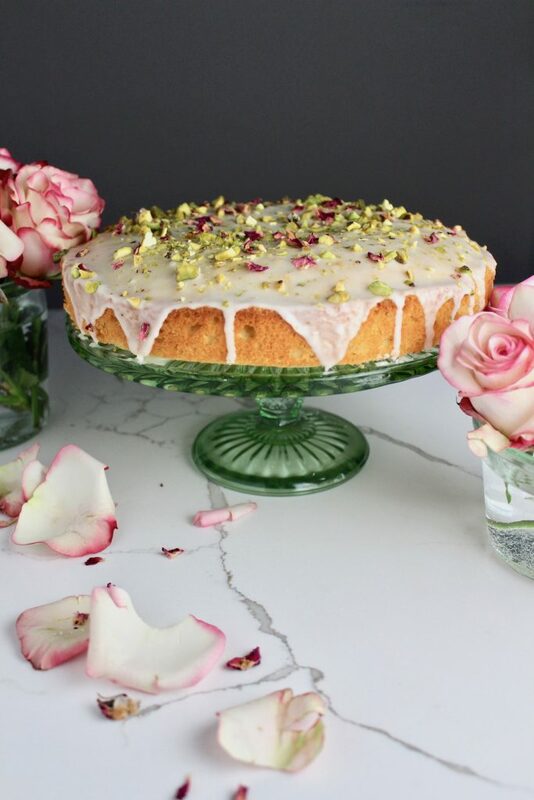 I found this Persian Love Cake recipe through Nigella and followed it to a T. I had a slightly larger pan so my cake was a little thinner – if you do the same just watch your cook time, you may have to reduce it slightly. 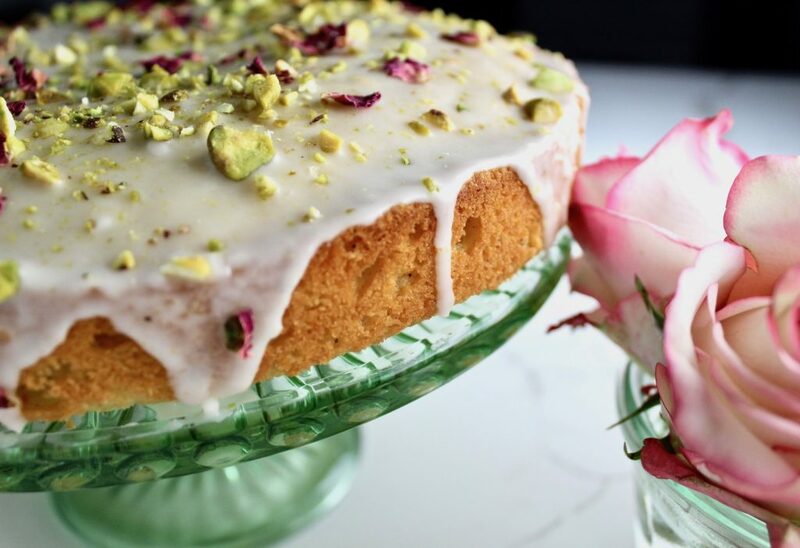 This Persian Love Cake is so delicious and the perfect accompaniment to a cup of tea in the afternoon or after dinner. It’s not overly sweet but the cardamom, lemon, and rose flavorings make this an exciting dessert to eat. Also is this not the most beautiful cake you’ve ever seen? 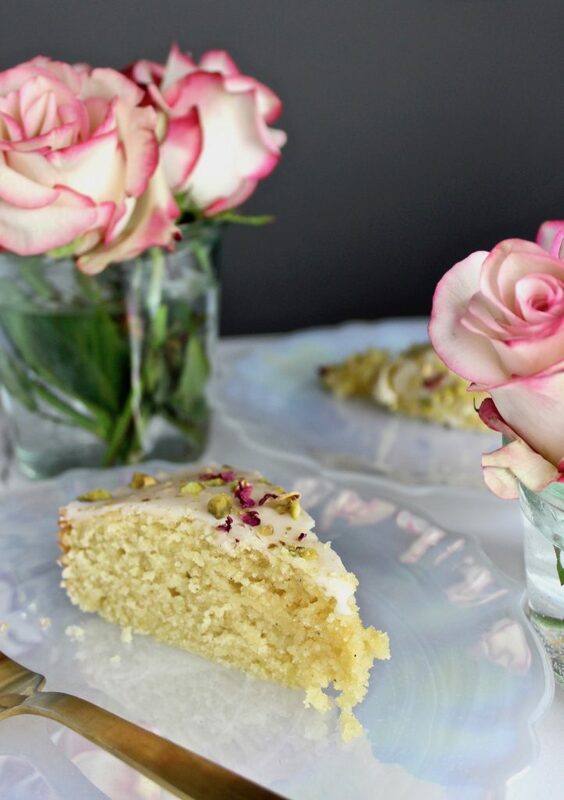 I love Persian Love Cake mostly because it’s very accessible to make, once you find cardamom and rose water. You don’t need a whole afternoon or fancy equipment. 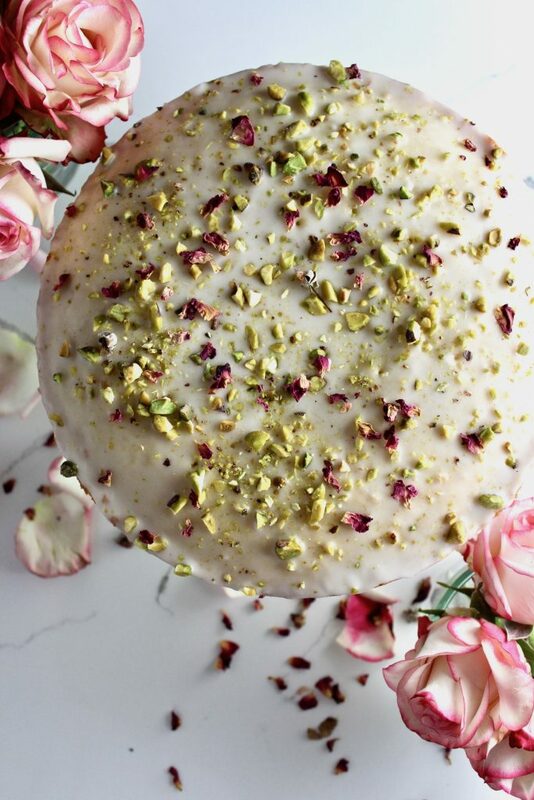 Even though Persian month is coming to an end, I will definitely be making this cake again in the near future. Line the bottom of an 8 or 9-inch springform pan and grease the whole thing with room temp butter. In a large bowl, cream the butter and sugar together. Once smooth and fully combined, add your eggs. Grind your cardamom seeds (from inside the pods). Alternatively, you can use powdered cardamom. Add this, along with the white flour, almond flour, lemon zest, lemon juice, rose water, baking powder, and salt. Mix well with a wooden spoon or on low with your hand mixer. Pour this into the cake tin and bake for 40-50 minutes. A toothpick in the center of your cake will let you know when it’s done. When your cake is almost done, start to make your drizzle. In a small pan on the stove, add the white sugar, lemon juice and rose water. Stir over low heat and let the sugar completely melt. While the cake is still warm out of the oven, poke a few holes over the top with a toothpick or fork and drizzle the syrup over it. Let the cake cool completely. Make your icing by combining powdered sugar, lemon juice and cold water. You should have a thick icing. 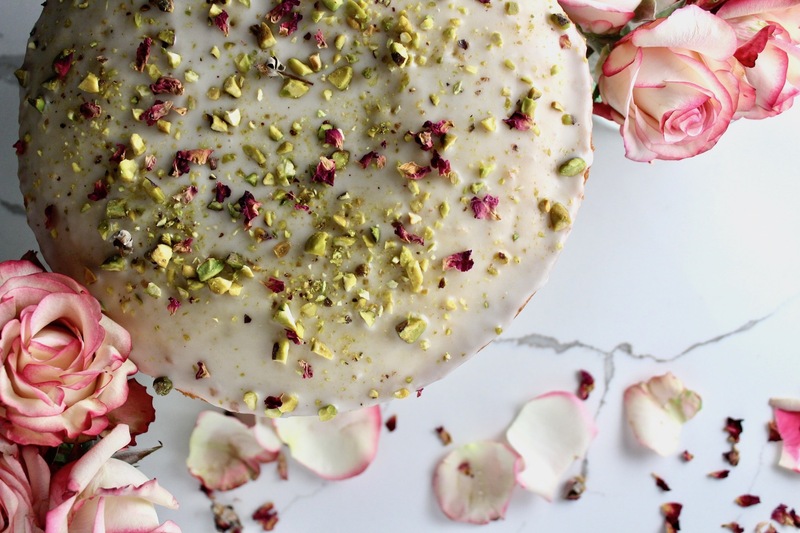 Spoon the icing over the cake and top with pistachios and dried rose petals.